On March 7, 2002, Kevin Frost's old life, as he knew it, came to an end. He'd been having trouble with his eyesight, specially night vision. He finally made an appointment with an ophthalmologist, and was told that he had Usher Syndrome, a genetic disorder, with only 8 to 10% vision remaining—tunnel vision. And it was likely to get worse. His driver's license was immediately revoked. He was forced to quit the forklifting job he loved. And he gave up the avocation he enjoyed most—being a veteran ice-hockey referee. Ultimately, his marriage ended. Frost was diagnosed with 75% (moderate-to-severe) hearing loss when he was 11, but, thanks to hearing aids and his speechreading sill, managed to get by. He went to work as soon as he graduated from high school, as a loading-dock driver, operating forklifts at a local supermarket chain's warehouse. He'd married and settled in Orléans, Ottawa, and had three children—Madison, now 11; Montana, 9, and Mitchell, 6. He had a spacious house and two dogs: a Pomeranian and a Chihuahua. The day after he got the catastrophic diagnosis, he contacted Canadian National Institute for the Blind's Vision Rehabilitation Services. Then he registered for a guide dog at Canadian Guide Dogs for the Blind, and after the expected wait and required month of on-site training, took home Nemo, a black Labrador, who has, he says, "given me my independence back." Nemo has already save his life six times, preventing him from being struck by cell-phoning or inattentive drivers. A friend who had been a professional speedskating champion encouraged him to return to the ice as a speedskater. After trying it out, he was hooked, and made a serious commitment. His goal is to become the first deafblind speedskater in Olympic history. 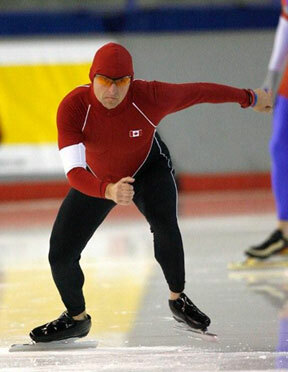 He hopes to compete in the 2010 Winter Games in Vancouver. And then there's the Paralympics. He wants to have speedskating sanctioned as a Paralympic sport. Several nations have expressed interest. His campaign continues. (Speedskating, by the way, isn't yet on the Deaflympics' roster either.) Frost, therefore, has competed exclusively with sighted, hearing skaters. When he began raising funds for equipment, local and international businesses and nonprofits responded with extraordinary generosity. The gym where he'd been a longtime patron held a fundraiser for him. A local pizza chain donated proceeds on designated days. As soon as he began competing in local and regional competitions, he began winning medals. He's competed mostly in short-track competitions (which are more dangerous, since the corner curves are tricky even for sighted skaters). He prefers long-track races, which have only one cross-over point. Race organizers have made some accommodations: substituting blaze-orange cones and lane markers for black ones, and allowing a blaze-orange flag to signal the final lap, since he can't hear the bell. He uses his unique status to educate his competitors, schoolchildren, the general public, and the police about deafblind people, tunnel vision, and how to treat people who use guide dogs. During warm weather, he's competed in boat racing—dragon boats and adapted rowing. Tunnel vision or no, he's set his sights on Olympic gold.